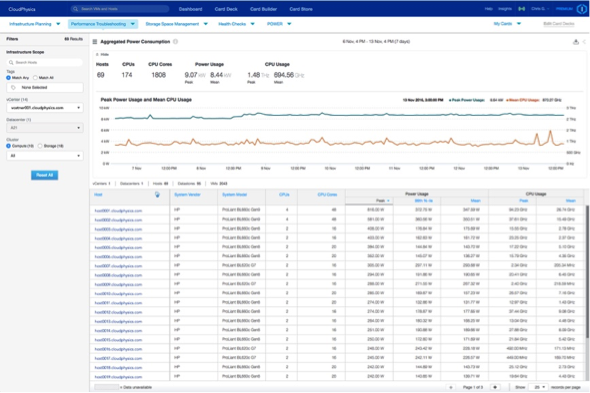 Quickly see the effects of CPU usage compared against power usage by hosts across the data center. The new Aggregate Power Usage Card instantly shows you the relationship of host CPU utilization compared to host power draw in watts for an entire data center. Each data center host draws varying degrees of power usage through the day based on utilization. The challenge is to identify those hosts which are delivering utilization most efficiently, based on their respective hardware models. A major element of this frustration is that older hardware or less dense configurations are consuming more power per workload in the data center—when they could be deployed to more efficient hardware. The CloudPhysics output can also share power efficiency at Peak, 99th, and 95th percentile—while simultaneously showing CPU load at that Peak, 99th, and 95th percentile. With this information, you can quickly calculate how efficiently individual servers deliver their workloads. See which hosts consume larger than normal quantities of resources so you can rebalance, tune—and save. This versatile new card proves how completely and quickly data-driven analytics solves the problem of resource overconsumption and its costly consequences. In just 15 minutes you can drill into a vCenter or group of hosts to see performance across resources for any given time period. Spikes of overconsumption stand out vividly!